Did you know that our universe is stretching out in all directions? It's true! Ever since the universe began about 13.8 billion years ago, it's been stretching out and expanding. Even today, as we use telescopes to see galaxies far away, we see they are moving away from us. And that’s not all. The farthest galaxies are moving faster than the ones close to us. This happens because of how the universe began, which we sometimes call the "Big Bang." 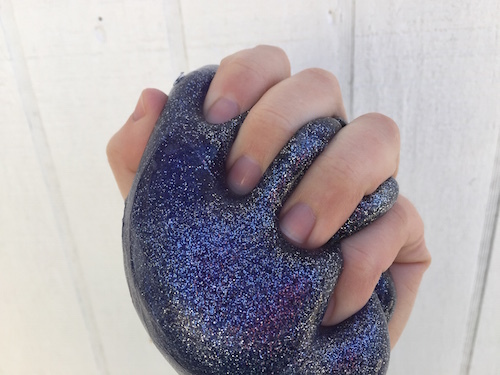 In this activity, you'll make your own stretchy universe slime. Do not eat borax, and don't wipe it in your eye. 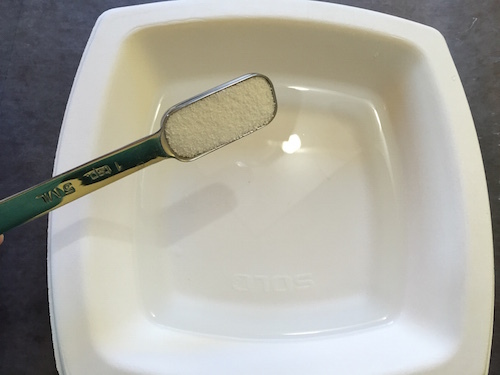 Borax is safe to use, and in fact is an ingredient in many laundry soaps, but do NOT put it in your mouth. You also don't want to have it on your hands and wipe your eye. If you do, rinse thoroughly with water. Refer to the borax package with any other safety concerns. 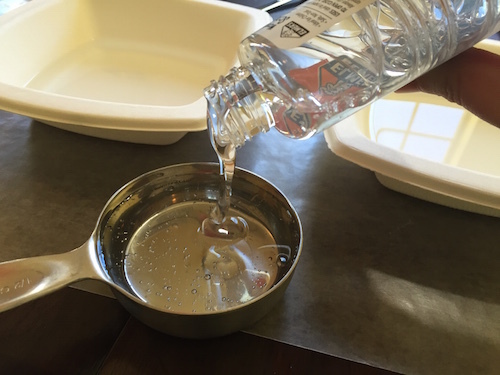 In one bowl, mix 1/2 cup of glue with 1/2 cup of water. Stir it together; it will mix nicely. 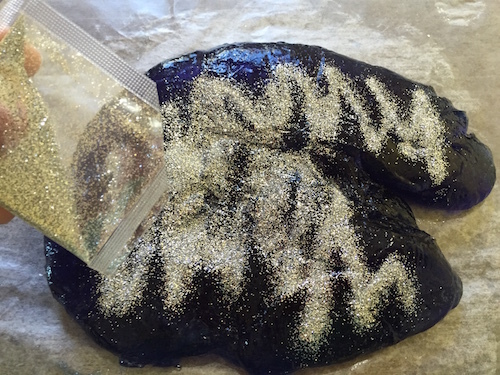 Note: You may also use white school glue, but your universe slime will be lightly colored and opaque. 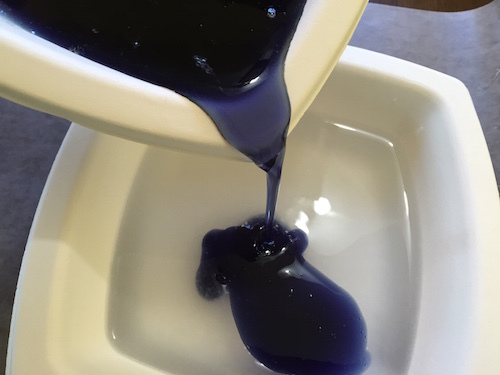 Add food coloring to the glue and water mixture. 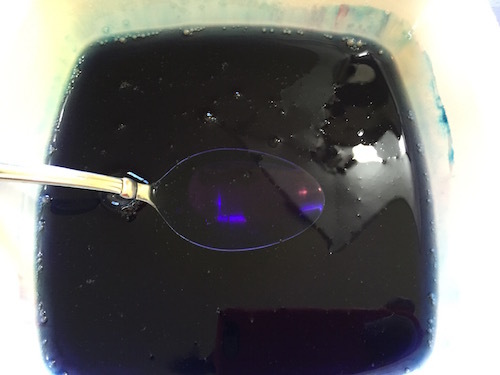 We used 6 drops of blue and 3 drops of red to get a nice, dark purple color. 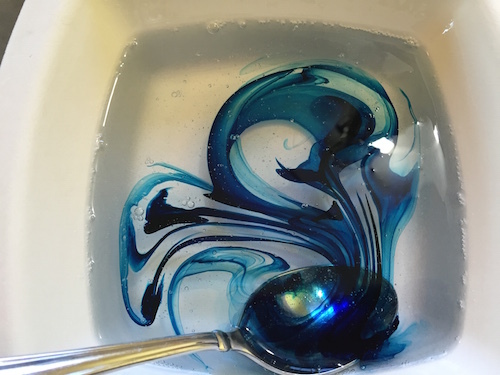 In the other bowl, mix 1 teaspoon of borax with 1 cup of lukewarm water. 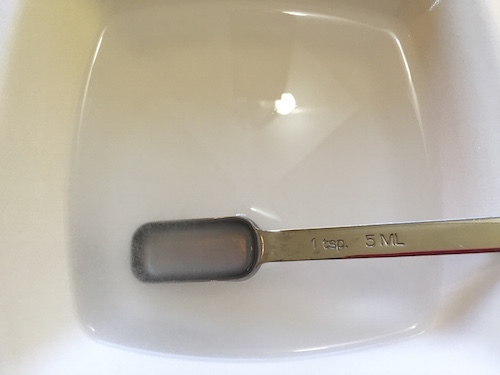 Stir until the borax is dissolved. This takes a while, so you have to be patient. 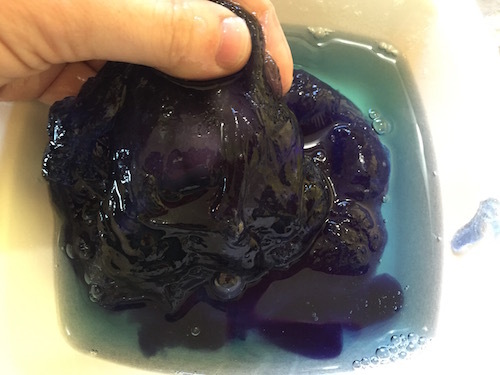 If you skip this step, your slime will not come together very well. Stir, stir, stir, until you don't feel the crunch of the solid bits of borax on the bottom. The water will start to look a little cloudy. 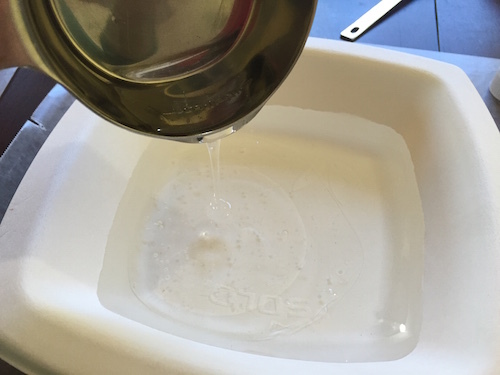 Add the purple glue mixture to your borax water, stirring slowly as you pour it. You'll see the slime start to form. Stir as much as you can. Use your hands to get in there and work it around. 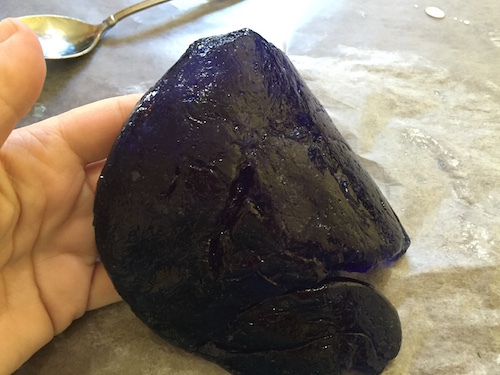 Take your glob of slime out of the bowl and put it on your wax paper. It's okay if there is some water left behind. It's time to add some glitter galaxies! 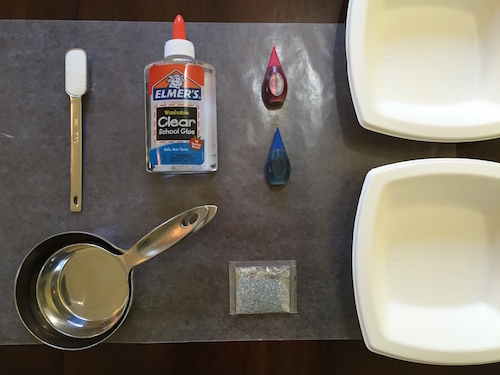 Flatten out your slime and spread glitter over the top. You can use any color or combination of colors, but lighter ones will work best because they will stand out against the dark purple. 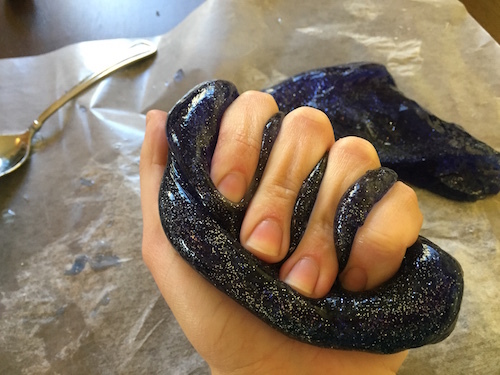 Fold your slime in half to seal in the glitter. Then press it out and fold it over again. 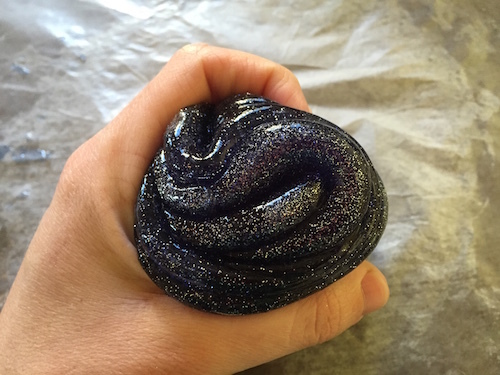 Keep pressing and folding and watch as the glitter spreads throughout your slime. Play with your handheld universe and watch it stretch and expand! 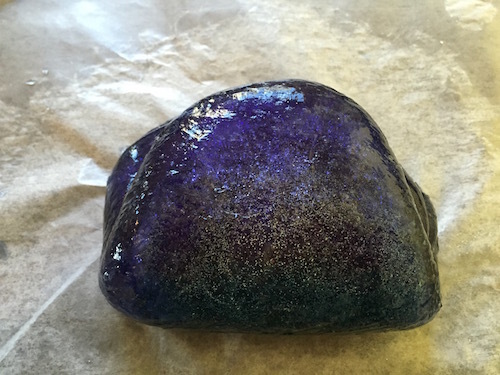 To keep your universe slime from drying out, store it in a sealed sandwich bag. 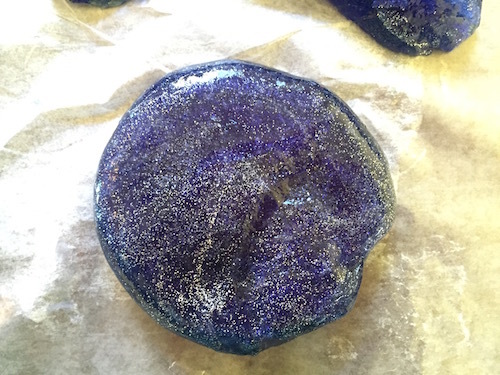 Do not wrap it in foil or wax paper because it will stick to those materials.